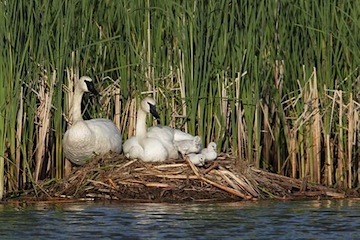 Tammy’s capture of the Trumpeter Swan pair with their three cygnets on the nest shows the how the use of a long lens, while factoring in subdued lighting produces a well exposed photograph. Finding the nest early on, watching how the pen and cob interact and setting up on the appropriate day shows how planning can create the desired effects. This nest was on private property and Tammy had the opportunity to watch the nest being constructed and the subsequent laying of five eggs. Not that all swan nests are on private property, but photographing nests on public property is subject to disturbance from other folks out recreating. Having access to private property allows you to practice ethical photography without having to worry about those outside disturbances. A number of photographs we have reviewed have a consistent theme when photographing swans – fog/overcast conditions diffusing the light and minimize contrast between the white birds and darker areas/shadows of the scene. Tammy utilized light, overcast conditions to remove these potential challenges and to take the photograph under optimal conditions. Take a closer look at the lighting. All of the swans are exposed with lighting from the front, not overhead. If the lighting were overhead, the underside of the breast of the bird on the left would be darker than the rest of the bird. So it was a photograph taken late in the day. This is where knowing your subject, the setting and then planning your photograph gives you the right results. Most very good wildlife photographers use a long lens when photographing wildlife. You can get frame-filling shots as in Tammy’s photo, and you can control the focus of the background. In this setting Tammy also used her lens to stay far enough away to prevent any disturbance to the birds, the ethical path to an outstanding photograph! Tammy had been monitoring the nest long enough to note that the eggs had hatched two days prior. The young were still using the nest two days subsequent to hatching AND that now both parent were now on the nest. During incubation the pen does all the brooding, while the cob does not take part in this activity. Even when the pen leaves for preening, feeding or any other reason, the nest is protected by the cob, but he does not incubate or shade the eggs. So having both adults on the nest at the same is an unusual occurrence! Tammy and one of her photographs were featured in this column in May, 2010. So here is an update of her background since that time. I have collaborated on a children’s story about Trumpeter Swans with Mary Lundeberg. Right now the book (Spirit of the Swan) is only available as an ebook on Kindle. However, we are currently working with an editor and small publishing company and hope to have the print version available later this year. Another accomplishment as a photographer is that one of my owl images was selected for the October 2010 cover of Your Big Backyard magazine, a National Wildlife Federation publication, and a greeting card company purchased one of my Trumpeter Swan images to use as a greeting card. Since May 2010 I have traveled to Alaska, Arizona, Montana, Hawaii, South Dakota, North Dakota, Texas, Wyoming, Colorado, and Florida to photograph mammals and birds, but my favorite subject to photograph is in my home state of Minnesota and next door in Wisconsin is the Trumpeter Swan. From Tammy: When I first started to photograph the swans several years ago, I mostly photographed them where they overwintered in Wisconsin and Minnesota. Nowadays I am thrilled to be able to photograph them year round. This spring I had two amazing opportunities to photograph nesting swans on private property. Both pairs ended up with five eggs hatching, and I was happy to be present at both sites when some of the eggs hatched. I hope to continue watching and photographing the cygnets as they grow up. Photographing Trumpeter Swans in the late spring and summer can be difficult on sunny days because the light is harsh, and the birds are white. The image was captured at a Minnesota site a few hours before sunset when the light is less harsh. The cygnets were two days old when the image was made. I used my 500 mm lens with a 1.4x teleconverter so that I could photograph from a safe distance but still get frame-filling images. We are pleased that Tammy was willing to share this “keeper” shot in support of Trumpeter Swans and The Trumpeter Swan Society. You are currently browsing the Trumpeter Swan Society Blog blog archives for July, 2012.